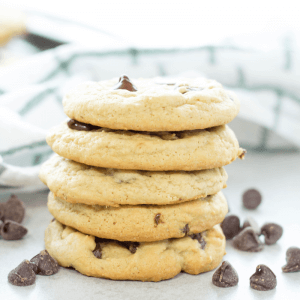 Magnolia Table Chocolate Chip Cookies are deliciously chewy cookies made perfectly with just basic baking ingredients. Remember that Magnolia Lemon Pie with Candied Lemon Slices inspired by Joanna Gaines recently? It was too good to not try another Magnolia Table recipe ASAP and these chocolate chip cookies did not disappoint. There is no crazy secret ingredient or special process- just a simple, homemade cookie that is soft and satisfying. Exactly what we need some days. Honestly, I have never been a huge fan of crisp cookies and could live without them. Chewy cookies on the other hand are my jam. JUST. CAN’T. STOP. EATING. THEM. 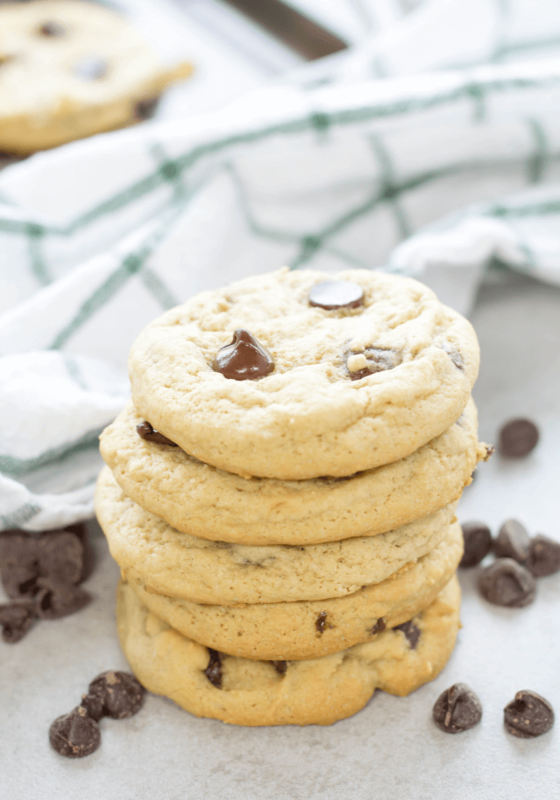 These Magnolia Table Chocolate Chip Cookies are those chewy type cookies that stay good and soft for days and completely addicting! So, I may be slightly impatient. I hate waiting for butter to soften enough to use for baking but you can easily and quickly soften your stick of butter in the microwave. Leaving the wrapper on, place the butter in the microwave on it’s side. Rotate the butter onto another side. Heat another 5 seconds. Repeat this for all 4 sides and the butter should be soft enough to work with. Place room temperature butter and brown sugar in mixing bowl. Beat with a hand or stand mixer until smooth. Add vanilla extract, baking soda, salt and 1 cup of flour. Beat again. Slowly add in the remainder of the flour and beat until thoroughly mix. Place batter in refrigerator for 30 minutes. Drop cookie dough balls onto a baking sheet giving each a little space. Bake for 11 minutes and then cool on a baking rack. Have you tried any recipes from Magnolia Table/ Joanna Gaines? Maybe you have even visited her restaurant or bakery! Let me know in the comments below and seriously, does this women ever sleep between books, tv shows, a home decor line, appearances and restaurants? 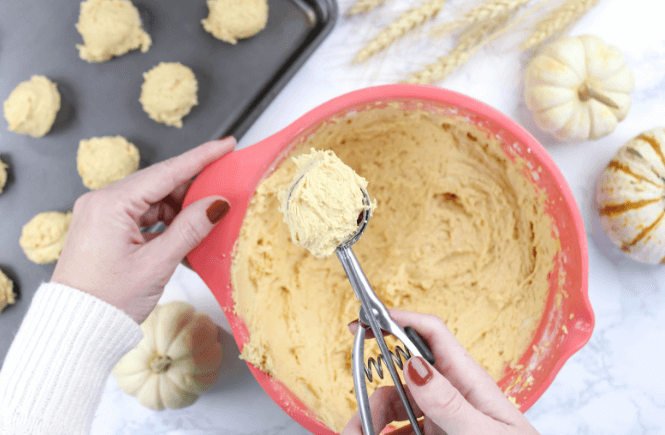 Pumpkin Sugar Cookies are made with pumpkin puree, pumpkin spice and basic sugar cookie ingredients such as sugar, butter and flour. 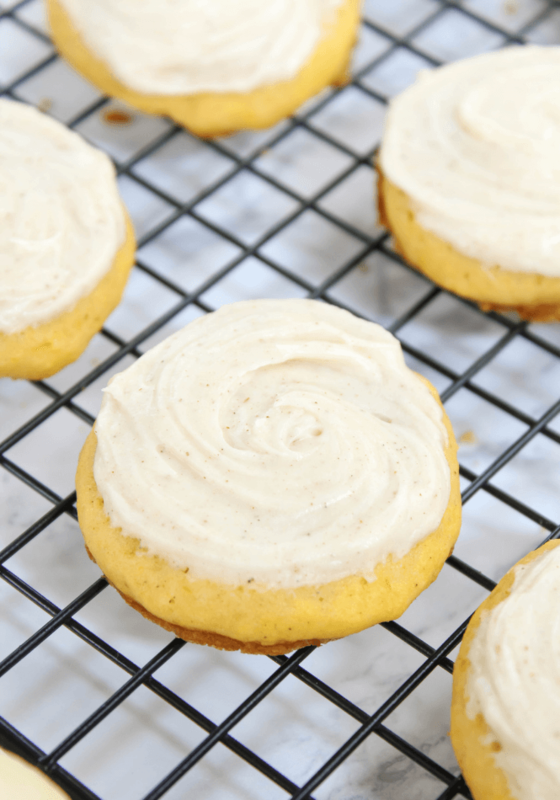 Add a cinnamon cream cheese frosting and these cookies are guaranteed to be a hit! 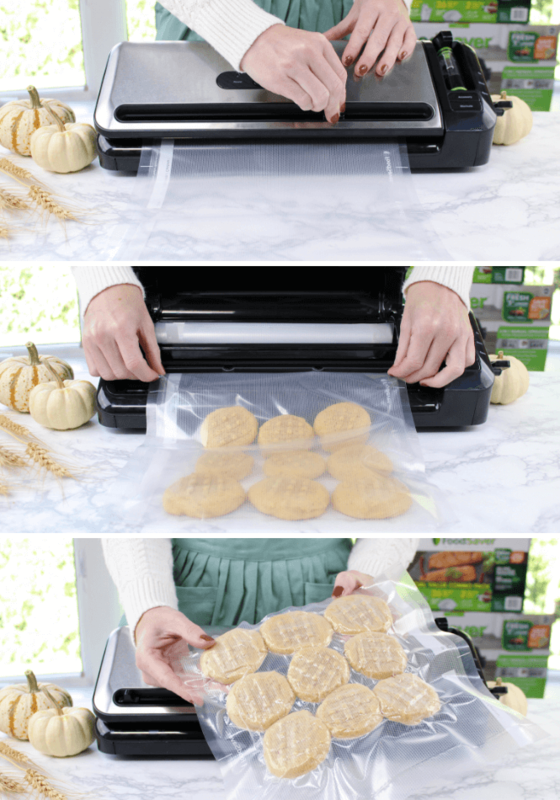 I am also sharing multiple ways to freeze cookies with the FoodSaver® FM3941 Vacuum Sealing System so you can get a start on that holiday baking early. The holiday season is crazy around here, just as I assume it is in every household! Between Christmas shopping, work, kids, seasonal activities and holiday gatherings with friends and family, time is limited. However, no matter the time constraints, there is no skimping on the seasonal baking. Time to stop by Costco to gather up my supplies in bulk! Utilizing the FoodSaver® FM3941 is great way to schedule out the holiday hours better by prepping some foods ahead of time. Plus, you can use this for so much more than just holiday baking. 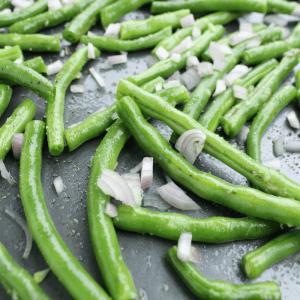 FoodSaver® is the solution to save food, save time and save money year round. Keep your food fresh up to 5x longer than with other storage methods saving you up to $2,700 yearly with the ability to buy in bulk and reducing waste. Keeping food fresh in the freezer or refrigerator with an airtight seal. Baked Goods- for soft, cakey textures try the FoodSaver® Canister so your baked goods hold their shape. 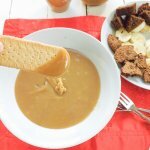 Liquids such as gravy and soups. Marinate- not only can you freeze meat but you can get an amazing marinade in minutes, instead of hours, using the Quick Marinate Mode. Cooking meat- by taking all of the air out, you can ensure your meat will be cooked evenly throughout. 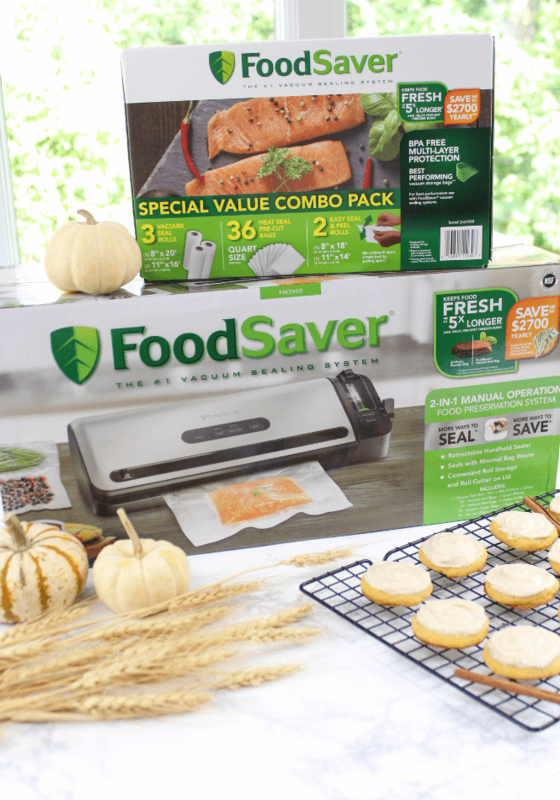 America’s #1 vacuum sealing solution is the FoodSaver®. 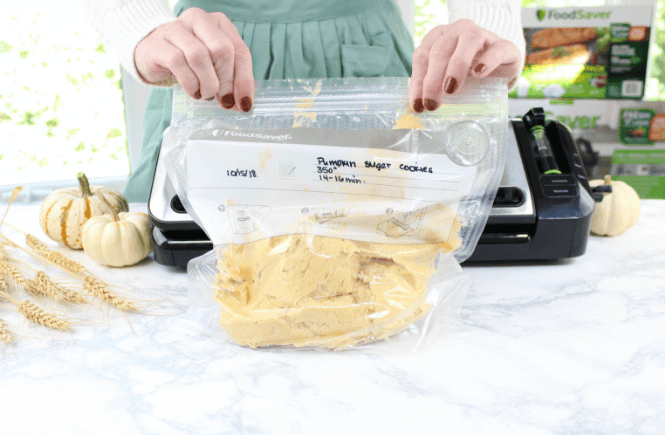 The FoodSaver® System includes vacuum seal bags, vacuum zipper bags and containers designed to work together with vacuum sealers for optimal performance. They are best for long-term freezer storage, blocking out air and helping to prevent freezer burn. 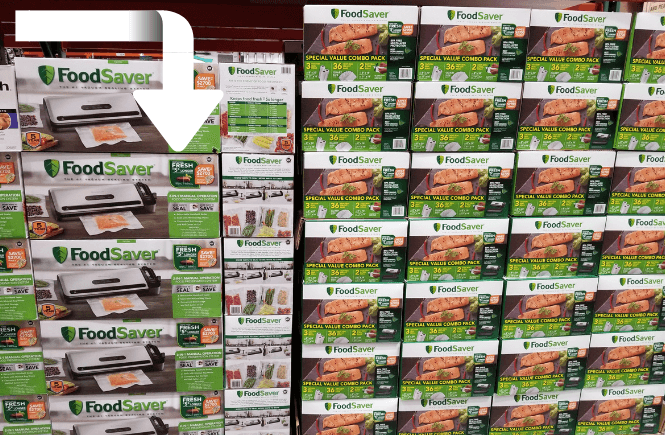 Costco is the place to go for your FoodSaver® FM3941! Get $40 OFF the FM3941 Vacuum Sealing System. Get $10 OFF FoodSaver® Bags and Rolls Value Pack. 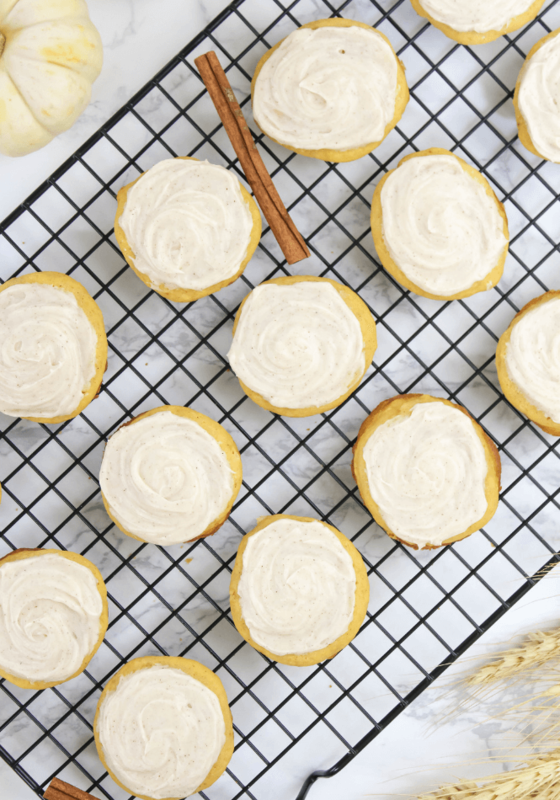 These Pumpkin Sugar Cookies are everything you expect from a delicious sugar cookie. They are buttery, soft and chewy but with a little addition of pumpkin flavor from pumpkin puree and pumpkin spice to give these cookies a special touch. 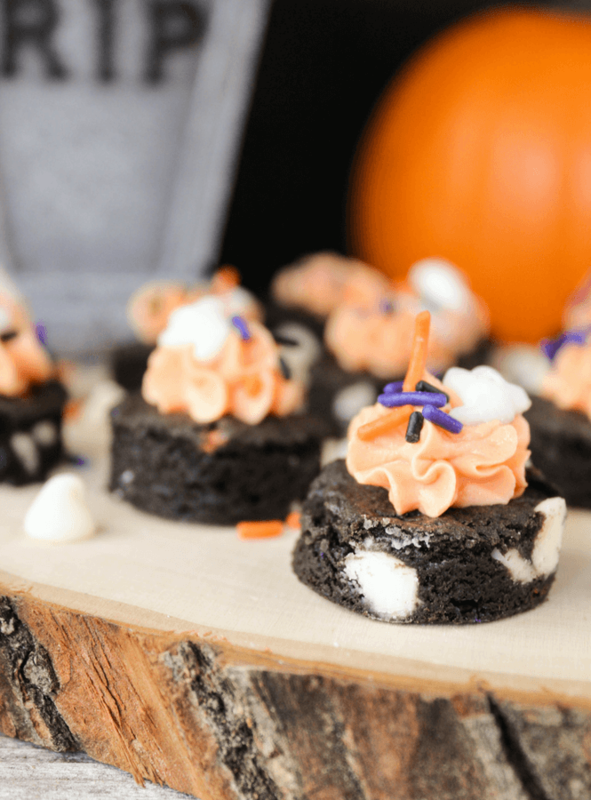 A cinnamon cream cheese frosting is spread over the top and balances out the pumpkin flavor nicely. Pumpkin and cinnamon are always better together after all and you will love them in this cookie. 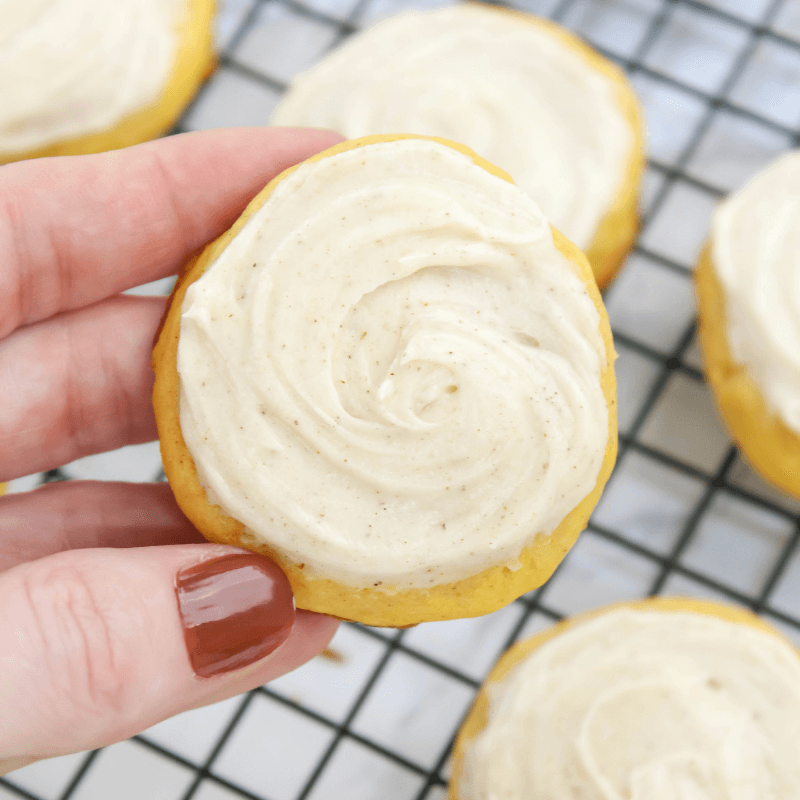 The base of these Pumpkin Sugar Cookies is like any other sugar cookie with equal parts sugar and butter. The sugar and butter are beaten together until really creamy and smooth. Add an egg yolk, vanilla extract, and pumpkin are added and mixed in. Stir the remaining dry ingredients together in a separate bowl and slowly add to the butter mix beating until smooth again. Place the cookie dough into refrigerator for at least 30 minutes and then bake according to instructions below. 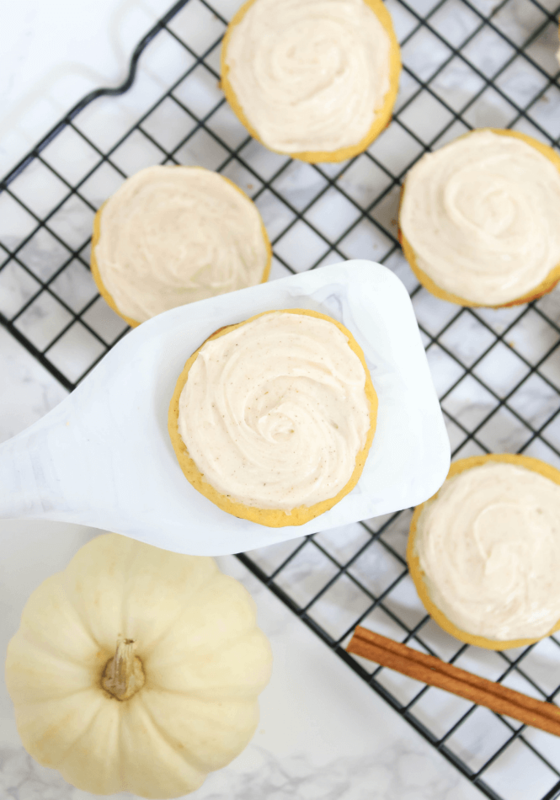 These Pumpkin Sugar Cookies smell ahhhh-mazing! A light sugary-pumpkin scent will fill your home and make it smell like the holidays are here. I want to say the cinnamon cream cheese frosting is optional but is it, really? Frosting is always a good idea in my book and the cinnamon with pumpkin spice are so lovely together that I think you would be missing out if you skipped the frosting over top. 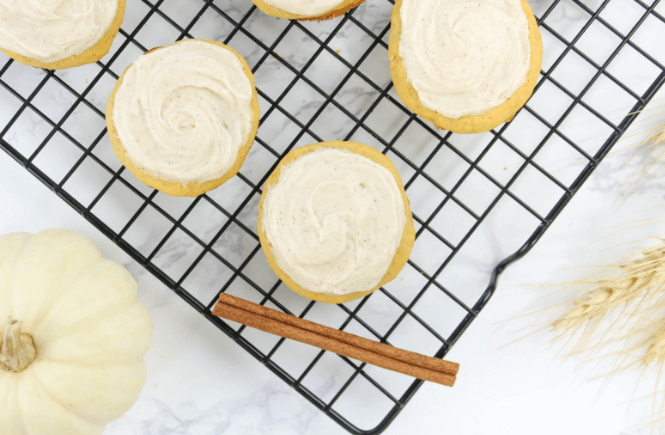 The cinnamon cream cheese frosting is just some cream cheese and butter beat together until smooth and then add in ground cinnamon and vanilla extract. The confectioners sugar is then added in slowly in increments and beat until you have this amazing creamy frosting. Pumpkin Sugar Cookies are made with pumpkin puree, pumpkin spice and basic sugar cookie ingredients such as sugar, butter and flour. 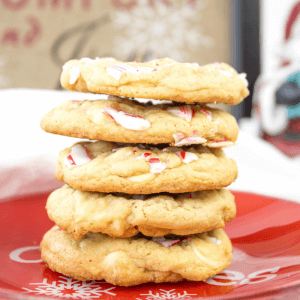 Add a cinnamon cream cheese frosting and these cookies are guaranteed to be a hit! In a large mixing bowl, add 1.5 cups granulated sugar and 1.5 cups softened butter. Use a hand or stand mixer to beat thoroughly for 3-5 minutes. Add egg yolk, teaspoon vanilla extract and .5 cup pumpkin puree. Beat until smooth and creamy. In a separate bowl, add the flour, salt, baking powder and pumpkin spice together and mix all those dry ingredients. Add the dry ingredients with the wet in increments and beat until thoroughly blended. Cover and place dough into refrigerator for 30 minutes. 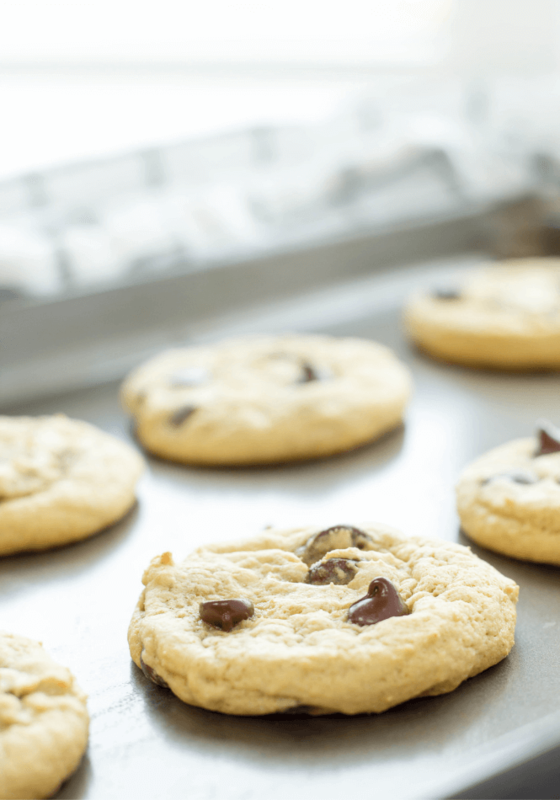 Remove cookie dough from refrigerator and spray a baking sheet with non-stick spray. Use a cookie scoop to portion the cookies and place onto baking sheet giving space between each. Once cooled, begin the frosting. In a large mixing bowl, add 1/4 cup softened butter and 8 ounce block of cream cheese. Make sure the cream cheese has been sitting out for awhile to warm up and is not straight from the refrigerator. Use a hand or stand mixer to beat the butter and cream cheese together until smooth and creamy. Add the teaspoon of cinnamon and vanilla extract. Beat again. Add the confectioners sugar in increments and beat until the frosting is creamy. Frost each cookie and serve or store in refrigerator until serving. To freeze baked cookies, start by freezing the cookies on a cookie sheet for one hour to harden. 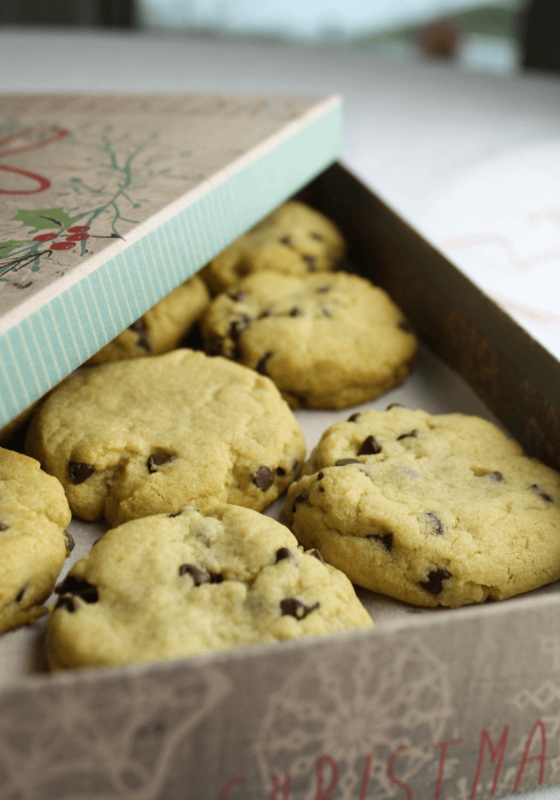 Your cookies should be cooled and non-frosted before placing into freezer. Turn the latch to OPEN position. Place a roll inside and pull out enough bag material to make the first sealing strip. Turn the latch to ON. Press the SEAL button. Light will turn off when seal is complete. Turn the latch to OPEN position and pull out enough bag material for the desired length you want your bag to be and close the lid. Press the SEAL button to make the seal for your next bag and slide the bag cutter across. Place the frozen cookies inside the bag in a row side-by-side leaving 3 inches of space on the open end of bag. Place the open end of bag into vacuum channel and close lid. Once the vacuum/seal light turns off, turn the latch to OPEN position. Open the lid and remove bag. Place the bag into freezer. Your cookies can stay in the freezer for months. When you are ready to serve, place the cookie bags into fridge to thaw out overnight. Frost before serving. Another method for freezing cookies using the FoodSaver® FM3941 is by freezing the cookie dough in ready-to-bake balls. Begin by making the cookie dough. Then, use a cookie scoop to form the cookie dough balls and place them onto a cookie sheet. Freeze the cookies for one hour to harden. Once the cookie dough balls are hard, you can stack the into a FoodSaver® Canister. Turn latch to the ON position and pull out the retractable handheld sealer. Remove the clear bottom portion from the handle and insert the tip into canister port. Press the ACCESSORY button to vacuum. When you are ready to bake the cookies, place the cookie dough balls onto a cookie sheet and cook according to the instructions adding 2 minutes of cook time. Frost each cookie and serve. 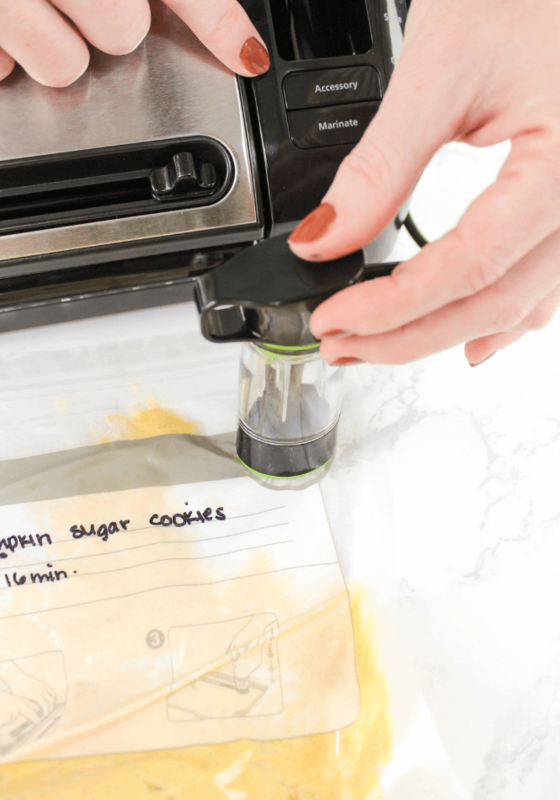 My favorite method for freezing cookies is to freeze the entire batch of cookie dough using the FoodSaver® FM3941 and a FoodSaver® Zipper Bag. 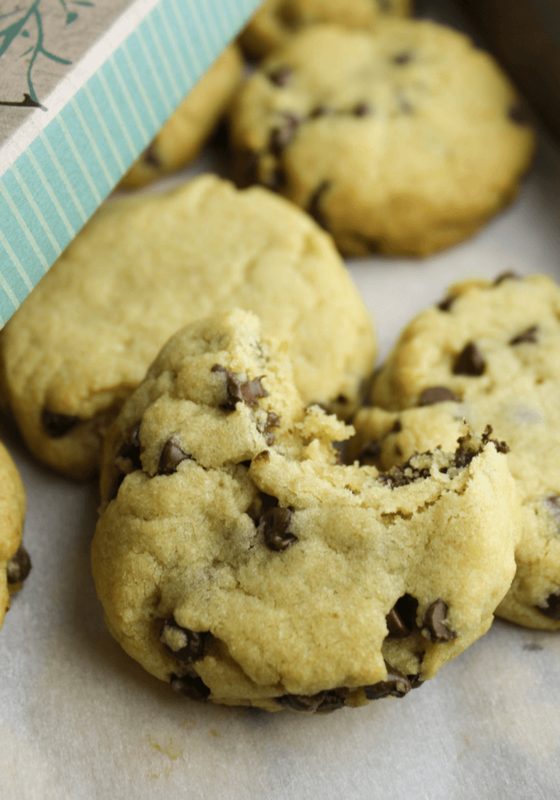 The cookie dough is thawed before baking and cookies are baked according to recipe instructions. 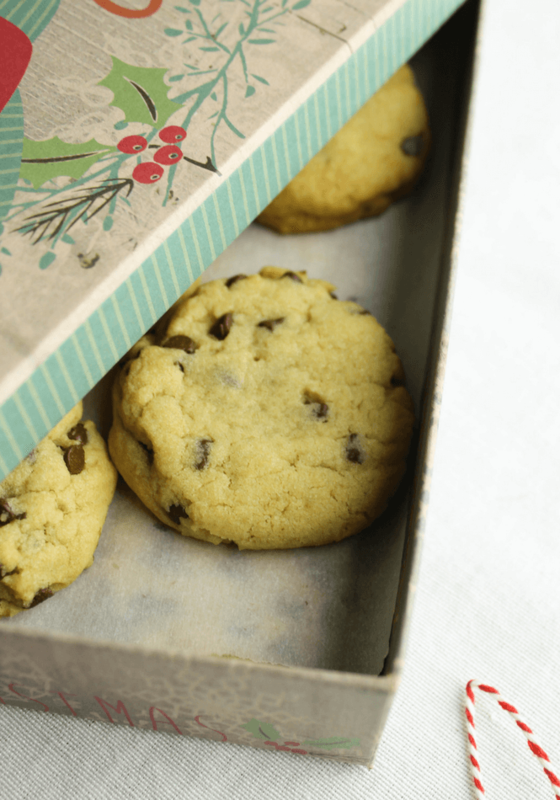 Place cookie dough into FoodSaver® Zipper Bag. Close the bag using the top zipper. Turn the latch to the ON position and pull out the retractable handheld sealer. Place the retractable handheld sealer on zipper bag valve. 24 hours before baking cookies, remove the bag from the freezer, open and put to the cookie dough into a bowl with plastic wrap over top. Place into the refrigerator. After 24 hours, bake cookies, frost and serve. Click HERE for more information on FoodSaver® Bags and Rolls Value Pack. How do you cram in all of your holiday baking and cooking? 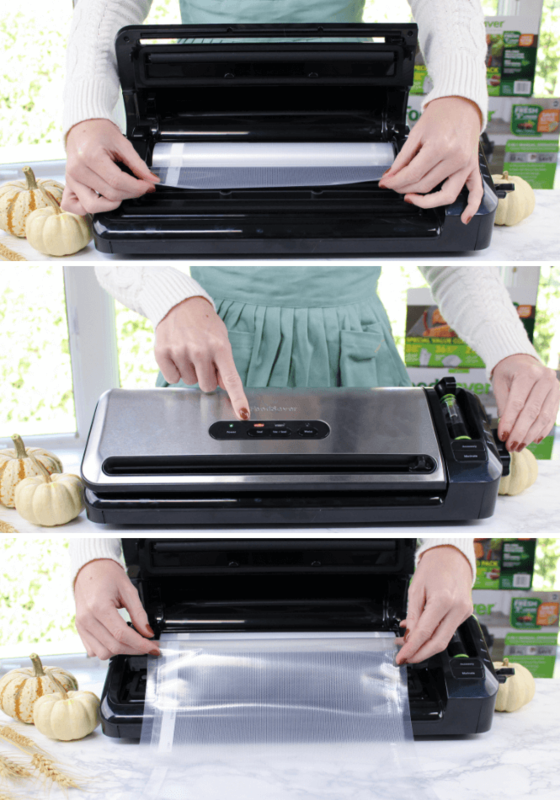 Let me know in the comments below how the FoodSaver® FM3941 will be a help to you this holiday season! 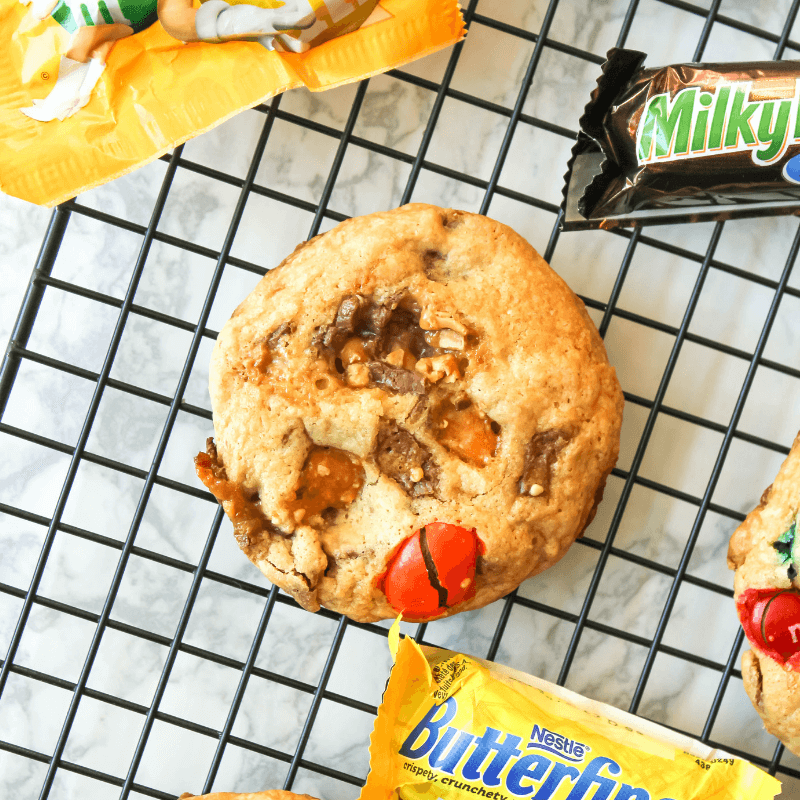 Leftover Halloween Candy Cookies are the perfect way to use up a chunk of that leftover Halloween candy made from your favorite bite sized candy bars and basic baking ingredients like flour, butter and sugar. I there a household at the moment (especially with kids) that isn’t drowning in Halloween candy? 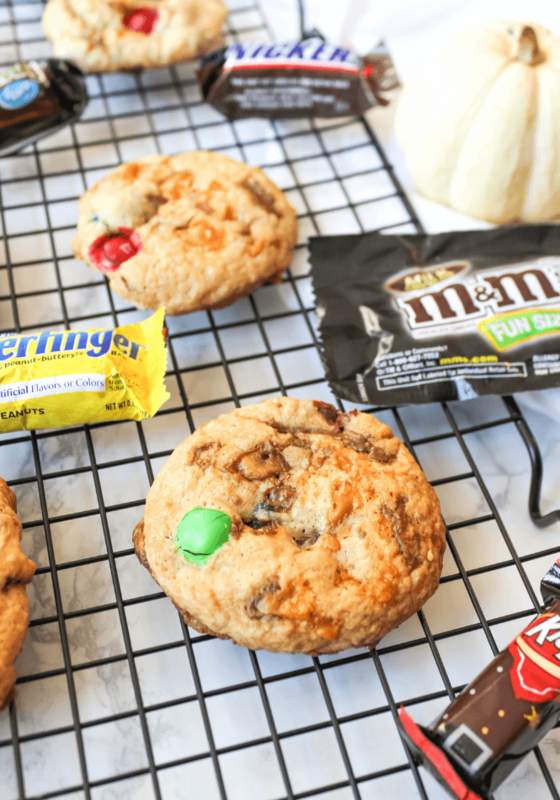 Typically, whatever Halloween candy sin’t eaten within 2 weeks after the holiday, I just toss in the garbage but I also hate waste so these Leftover Halloween Candy Cookies are a great way to get rid the candy. Send some to work with my husband… gift to neighbors (like they don’t have enough sugar in their homes too, haha)… or just make a fun treat for the family. Leftover Halloween Candy Cookies are just a basic chocolate chip cookie recipe I have had around for awhile but we are swapping those chocolate chips for whatever chocolate candies are still around. Pick the chocolates that won’t get eaten or do a mix of your favorites. Totally up to you. Some candies will stick more than others so keep that in mind. Butterfingers for example are super sticky when baked so I did just a sprinkle of Butterfingers on the top. Chop 2.5 worth of Halloween chocolate candies. 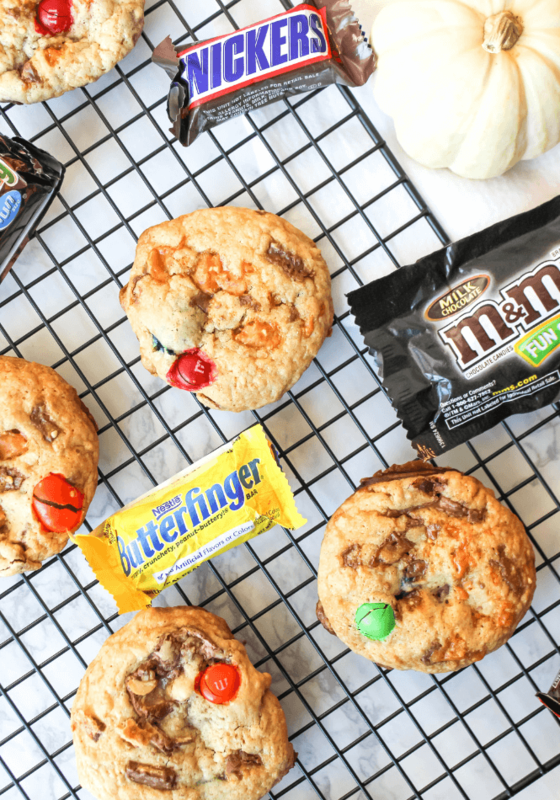 Pick your favorites- M&M's, Snicker's and Reeses work well. Set to the side. Use non-stick spray on the baking sheet. 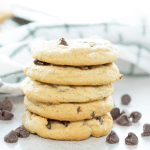 Crisco Mini Chocolate Chip Cookies made with Crisco butter flavor, milk chocolate, and basic baking ingredients. 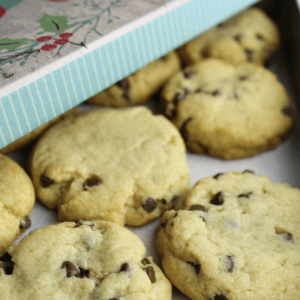 My grandmother always baked using Crisco or a ton of butter (literally) and one of my favorites are these Crisco Mini Chocolate Chip Cookies that she baked every year around Christmas time. These cookies are really simple and stay soft for a long time. If you prefer your cookies crispy, just bake a bit longer. I feel like baking Crisco Mini Chocolate Chip Cookies has become a tradition in the family. My grandmother passed away a few years ago and some traditions have been discontinued… I think that is a normal within families. It is time to start building my own traditions now and these cookies are here to stay. 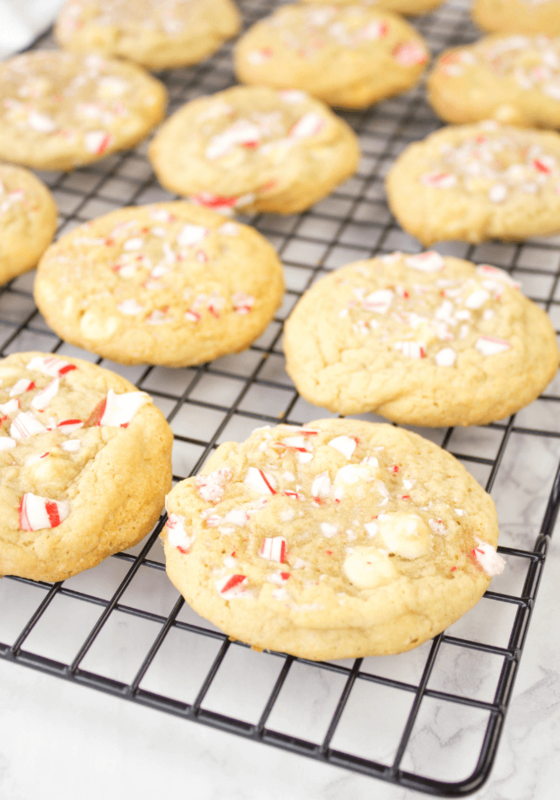 I told you earlier that these cookies are easy to whip up and they really are! You just need to beat everything with a hand mixer, stir in those yummy chocolate chips and bake around 10 minutes. Create gift boxes for your neighbors, friends and co-workers to say Happy Holiday’s. 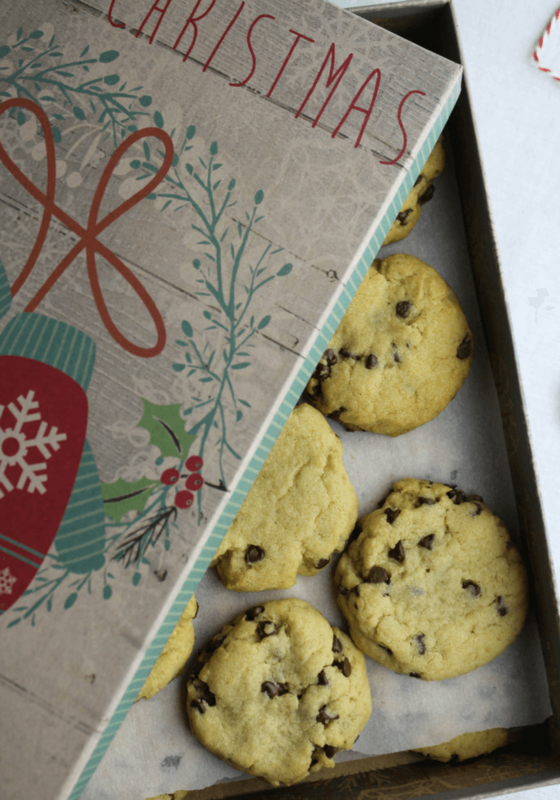 Line parchment into a festive box, place a row of cookies followed by another row of parchment paper and cookies. In a mixing bowl, add salt, baking soda, flour and mix together for your dry ingredients bowl. In a medium mixing bowl, use a hand or stand mixer to beat the vegetable shortening and brown sugar. Add in the milk, vanilla extract, and egg. Mix in the dry ingredients until blended. Spray a non stick baking sheet. 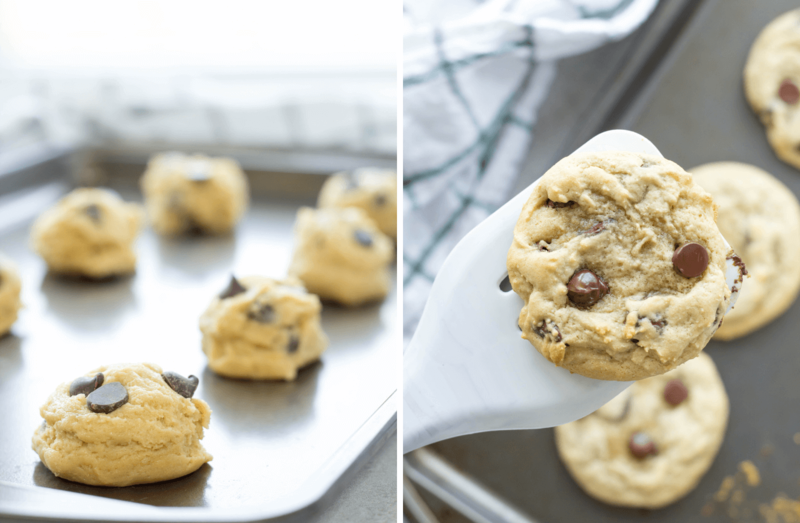 Use a cookie scoop to place your dough on the baking sheet leaving a few inches between each cookie. Bake for 10 minutes. You can bake another minute or two if you want them crispier. Did your grandmother bake using Crisco? What about you? 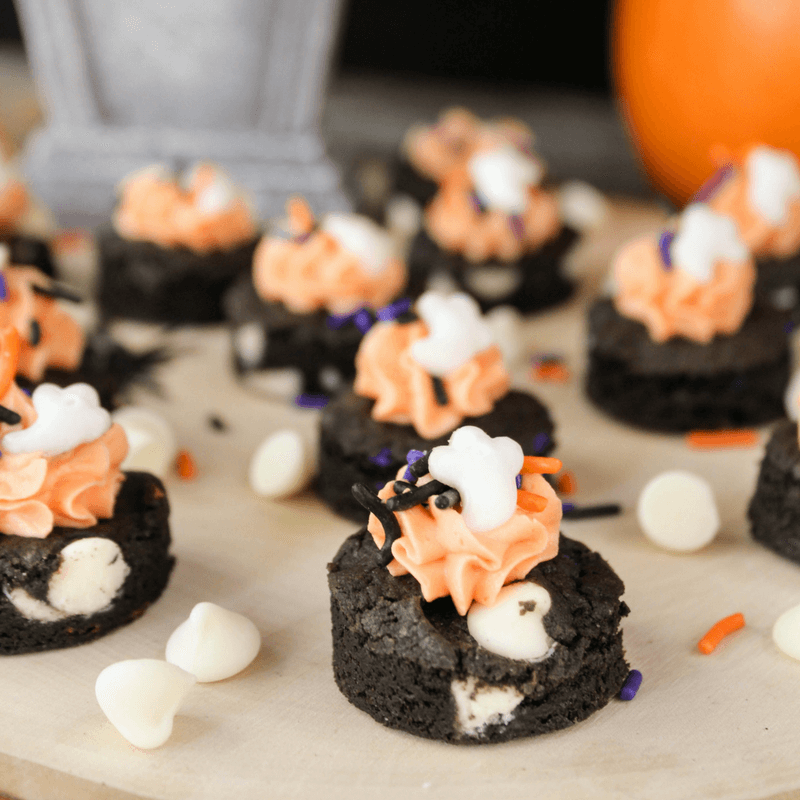 Halloween Fudge Cookie Bites are a fun, miniature treat perfect for your upcoming Halloween festivities. 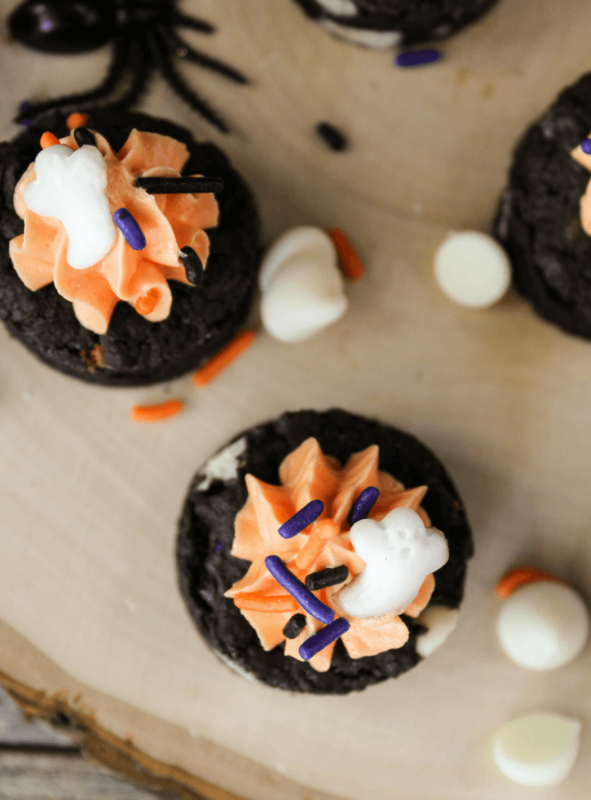 Made with your basic cookie ingredients, cocoa, chocolate fudge pudding mix and sprinkles topped with frosting and more Halloween sprinkles. Fall may be my favorite time of year and one bog reason for that is Halloween! I love the costumes, decorations, spending time with the family at the pumpkin farm, the parties with friends, and the fun deserts! It is a great time to get creative, whether with your costume or with food. 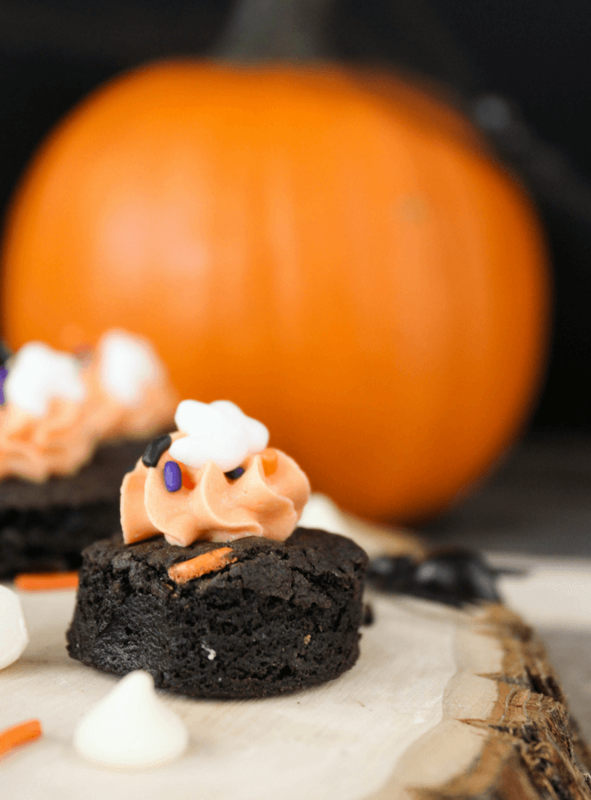 Halloween Fudge Cookie Bites could pass as a cookie or brownie with a great fudge-like flavor. 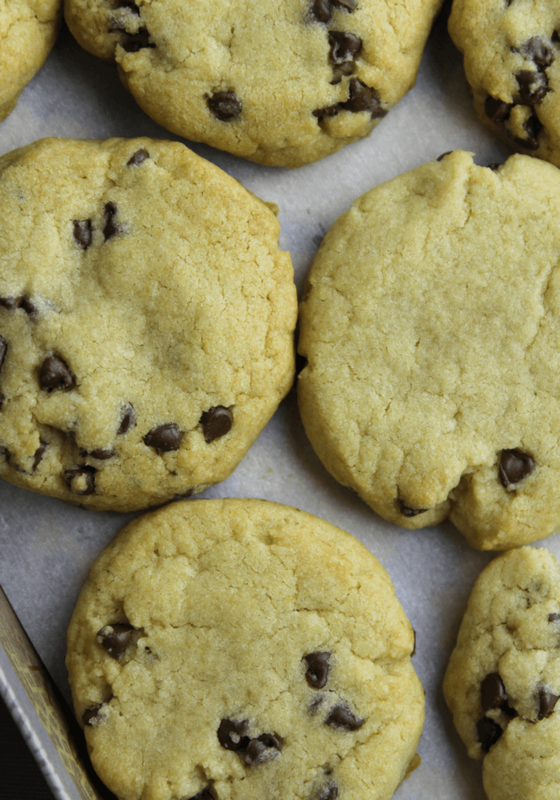 The pudding mix put into this cookie batch makes your cookies so chewy and will last for days. 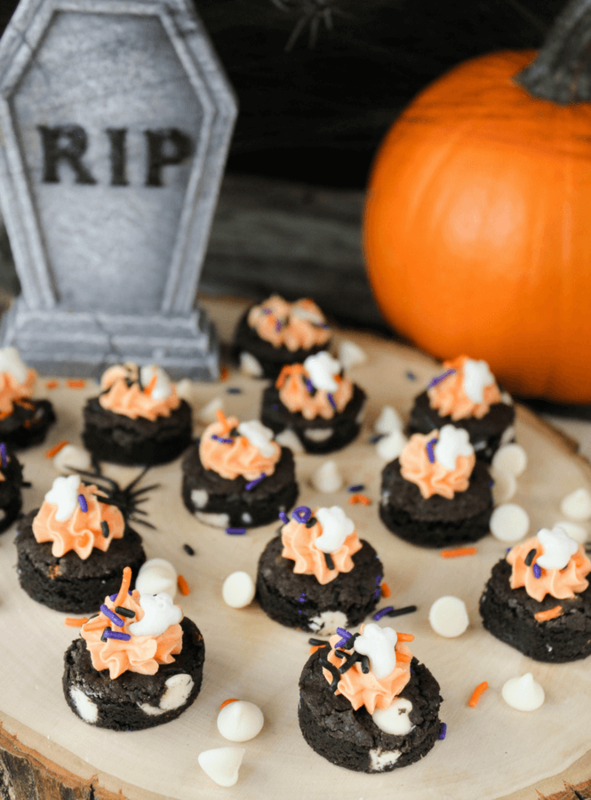 This recipe for Halloween Fudge Cookie Bites can be utilized in various ways also! You can make regular Halloween cookies, large circular cut out cookies with frosting or what we did today with the 1 inch circular minis topped with the frosting and sprinkles. 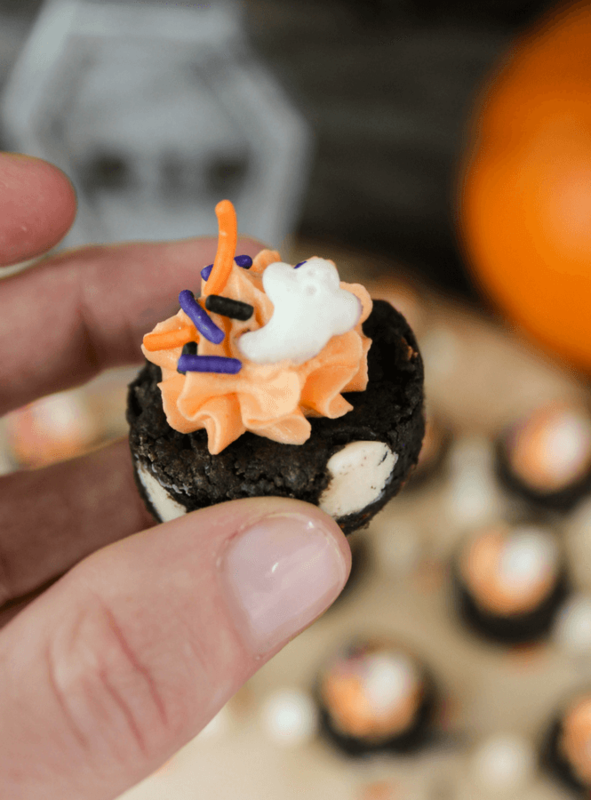 I think the mini bites are just really fun and great for Halloween parties or young children. I have a two year old, one mini cookie is just the right amount. Use a hand or stand mixer to make 1 cup butter softened and creamy. Add in 3/4 cup brown sugar, 3/4 cup granulated sugar, 1 teaspoon salt, 1 teaspoon baking powder, 1/4 cup dark cocoa, 2 1/4 cup flour, 2 eggs and 1 teaspoon vanilla extract. Thoroughly mix. Add in the packet of instant pudding, mix. If you want super dark cookies, you can add a few drops of black food dye now. Stir in the cup of chocolate chips and most of the sprinkles. Leave some sprinkles for garnish. I use an ice cream scooper for each cookies to place onto a cookie sheet. Press down each cookie slightly to make the tops pretty even. 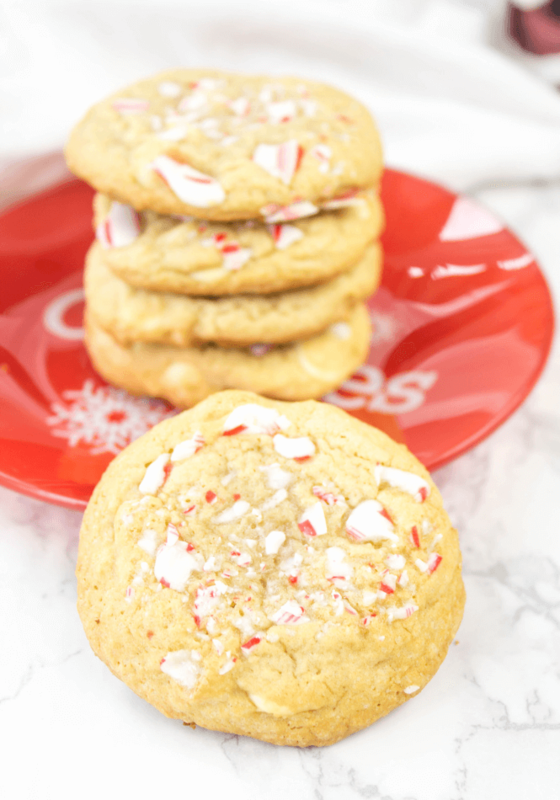 Place a few sprinkles on each cookie. Now, you can serve as is or cut into smaller cookies with frosting. To make the mini cookies, use a 1 inch cookie cutter to cut 3 minis from one regular size cookie. Throw away/snack on the scraps. Time for frosting! Mix .25 cups softened butter with .25 cups shortening. Use a hand or stand mixer to mix until creamy. Slowly add in the 2 cups of confectioners sugar, desired amount of orange food coloring and 1 tablespoon milk. If the frosting is too thick, add in a pinch more milk and mix thoroughly. 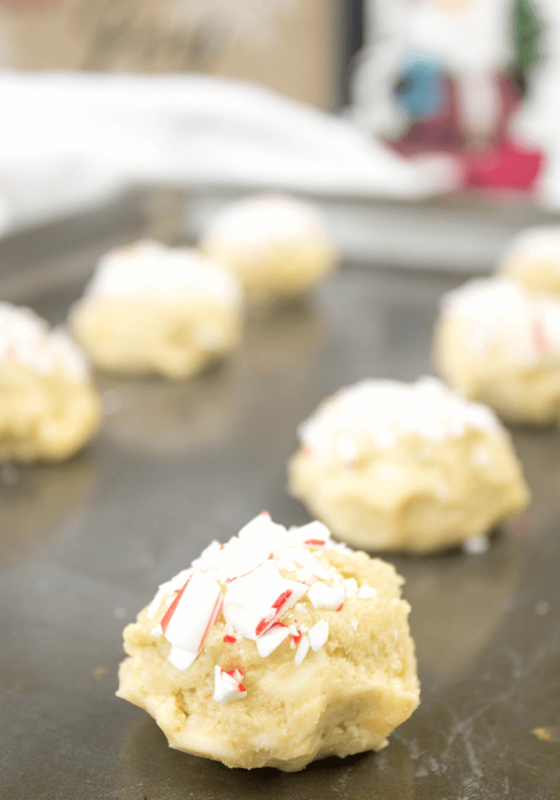 Place frosting into a pastry bag with a medium size tip of choice and frost a dollop onto each mini cookie. Add more sprinkles over top and enjoy! What is your favorite part of Fall? Are you a huge fan of Halloween like me? I want to hear about how your family celebrates this time of year. 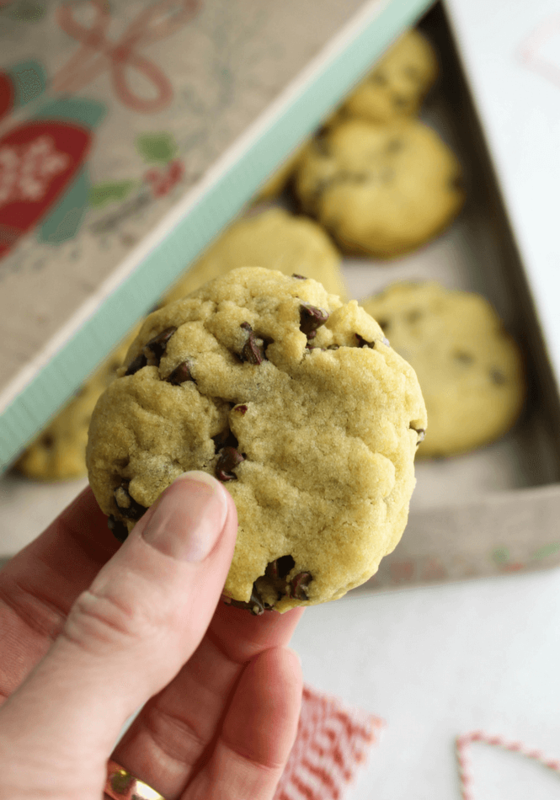 Mint Chocolate Chip Cookies recipe! I am excited about this one ya’ll. Since I can remember, mint chocolate chip ice cream has been on my favorite foods of all time list. 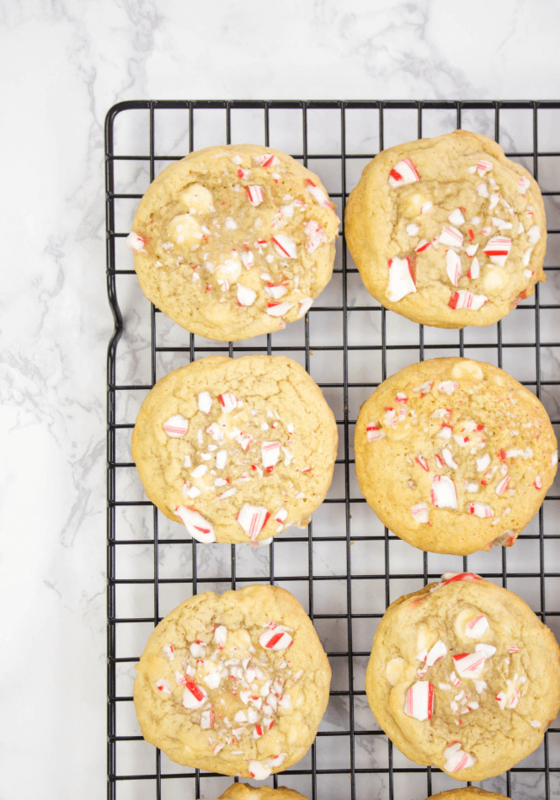 These cookies taste like the ice cream but in cookie form. So good! Minty, refreshing with chunks of Andes mint and milk chocolate. This recipe was inspired by Friday Cake Night. I can’t take all the credit for this one unfortunately. The cookies are chewy and so delicious. I made a huge batch and sent them to work with my husband after eating an embarrassing number of them myself. I am usually good around treats and can be happy with one but anything minty I got bonkers over and have zero self control. Did you catch the Andes Mint Milkshake recipe from last week? Same deal. No self control. 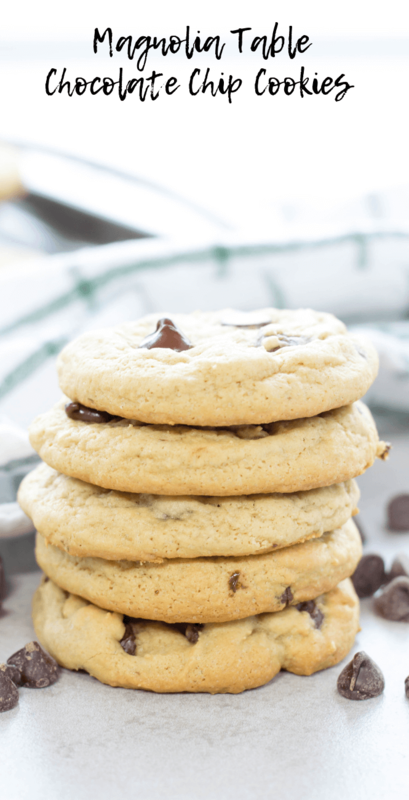 These Mint Chocolate Chip Cookies are really simple to make. Mix a bowl with dry ingredients, mix another bowl with wet ingredients. Add the bowls together and then hand mix in the food coloring and chocolate chunks. One trick I have for cookie dough to bake well is to let it sit in the fridge for a little bit before baking. This helps the cookies stay nice and plump because they do not spread as much. I noticed these cookies already spread more than others so make sure to get that cookie dough slightly chilled. I really love these cookies for holidays. Christmas and St Patrick’s Day would be perfect! Also, just bake some for a fun after school treat for the kids. A flavor that is familiar but still different in a cookie. The kids really loved them. Just try not to eat the whole batch before the kiddos get home. I think that was a message to myself more than anything. Haha. Grab ingredients, measuring cups, baking sheet, 2 large mixing bowls, hand mixer or stand mixer, whisk, small bowl, knife, cutting board, spatula, and a cookie scoop. In one large bowl, add dry ingredients: 2 teaspoons baking powder, 1 teaspoon baking soda, 2 teaspoons cream of tartar, salt, 3 cups flour, and 1.5 cups sugar. Hand mix. Set to side. In a small bowl, whisk 2 eggs well. Set to side. On the cutting board, chop your Andes mints and .5 cup worth of milk chocolate cut into small chunks. In a second large bowl add wet ingredients: eggs, 1.5 teaspoon peppermint extract, 1 cup room temperature butter. Use the hand mixer to blend well. Add your first bowl of dry ingredients and mix all together. Add your chopped Andes mints, chopped milk chocolate chunks and 15 drops green food coloring. Use your spatula to mix well. Set in fridge for 20 minutes. Remove cookie dough from fridge and scoop onto cookie sheet leaving space between. These expand a decent amount so bake 8 at a time. 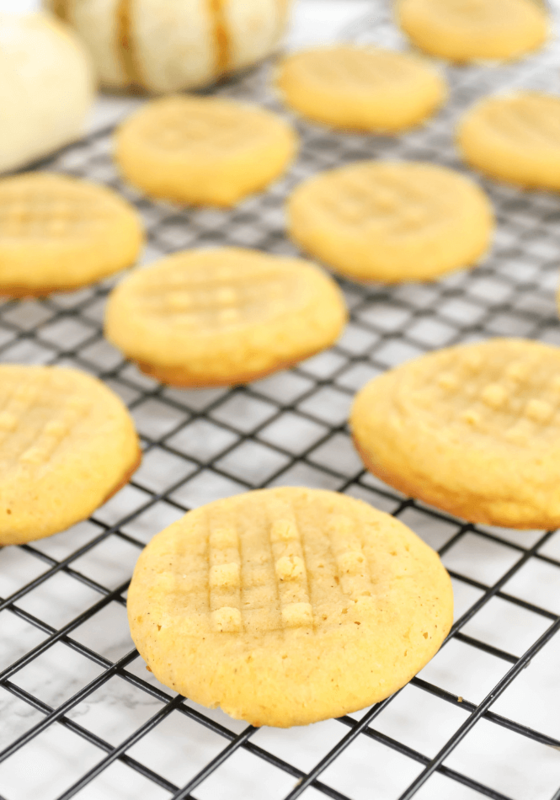 The Best Peanut Butter Cookies are chewy, soft, slightly crumbly with lots of peanut butter! Ohhhh how I love peanut butter! I browsed around for a good peanut butter recipe and stumbled upon this one here. I read the reviews and people said they fell apart and were slightly salty. Uhm, hello dream cookie. I recommend using unsalted butter with a teaspoon of salt or salted butter without the added salt. One or the other. I love salt but you don’t need to overpower your cookies. Creamy peanut butter was used today for The Best Peanut Butter Cookies but you can easily swap for crunchy and it will be delicious. I always try to give a tip for recipes but this is really simple. Mix all your ingredients besides the flour together well. Next, add the flour and mix another minute. Bake them. Easy. Make sure that your butter is softened and your egg is at room temperature before starting the cookie dough and they should bake up perfectly after a 20 minute rest in the refrigerator. Recipe adapted from Rachel Schultz. Gather ingredients, baking sheet, parchment paper, fork, cooling rack, mixer, measuring cups, mixing bowl and cookie scoop. Allow time for the egg to warm and butter to soften. In the mixing bowl, add .5 cup butter, 1/4 cup sugar, 3/4 brown sugar, egg, tablespoon vanilla extract, teaspoon salt and baking soda. Use a stand or hand mixer to mix all ingredients well. Add 1.5 cups flour and mix again until completely bended. Set cookie dough in refrigerator for 20 minutes. Scoop dough onto baking sheet allowing enough space for cookies to expand. Using the fork, press cookies down a bit. Place in oven for 9-10 minutes. Place on cooling rack for 10 minutes. Simply Made Recipes is a participant in the Amazon Services LLC Associates Program, an affiliate advertising program designed to provide a means for sites to earn advertising fees. If you click on an affiliate link and make a purchase, we may receive a small commission. This costs nothing extra to you and helps keep Simply Made Recipes running! It’s that time of month again for Peanut Butter Bash and I made Oatmeal Peanut Butter and Butterscotch Cookie Sticks. 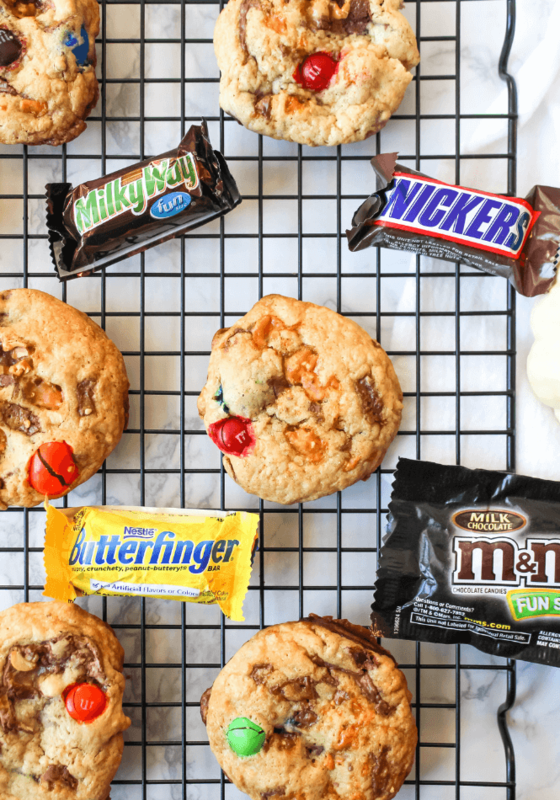 Peanut Butter Bash is a group of food bloggers that get together once monthly to all create a recipe using peanut butter and a mystery ingredient! 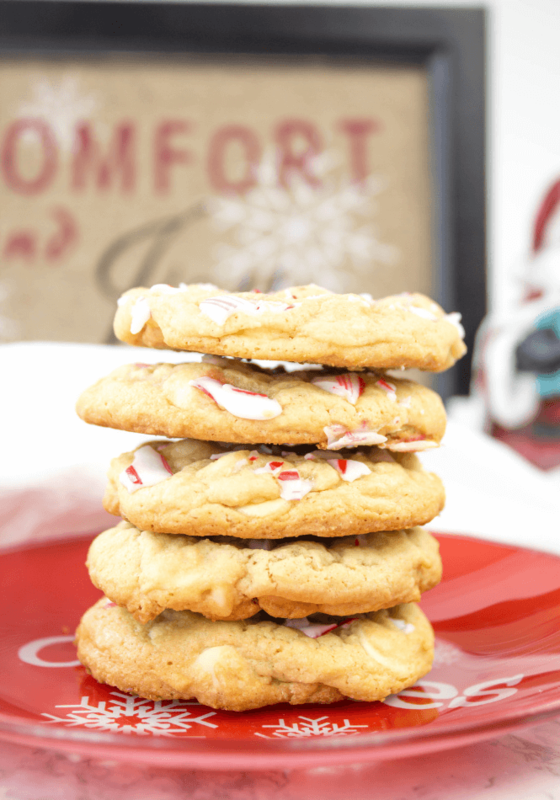 December’s mystery ingredient was butterscotch so I immediately thought about cookies. I love butterscotch in cookies, they add such a great flavor with the creamy peanut butter and oats. Make sure to check out what the other members of Peanut Bash created this month! Links provided at the bottom of the post! The best cookie bars or cookie sticks in this case, are gooey and fall apart. That’s my opinion of course, maybe you are a crispy cookie person. These Oatmeal Peanut Butter and Butterscotch Cookie Sticks literally melt in your mouth! I like the sticks over cutting into a bar because they dunk in milk perfectly, although I won’t even lie, if its fresh out of the oven the cookie will probably fall apart in the milk. So cookie sticks are perfect for day 2 cookie consumption of dunking in a big glass of milk. Gather ingredients, large mixing bowl, foil, cooking spray, mixer, spatula, 9x9 baking pan and measuring cups. In the large bowl, add .5 cup butter, .5 cup sugar, .5 cup brown sugar, 1 egg and .5 cup peanut butter. Mix with hand mixer until smooth and creamy. Add teaspoon vanilla extract, 1 cup flour, 1 teaspoon baking soda, and salt. Mix until smooth and creamy. Lastly, add the .5 cup oats and .5 cup butterscotch chips and using the spatula mix all ingredients together into a nice cookie dough. Prepare the 9x9 baking pan by putting foil in it and spraying with cooking spray. Add the cookie dough to the pan and use the spatula to even out the top. Place in oven for 30-35 minutes. Remove the foil and cookies from cookie pan. Cut into sticks or bars. I got 12 cookie sticks from todays batch. 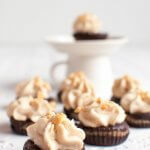 Butterscotch Chocolate Cups with Peanut Butter Frosting from Queen of Delicious. 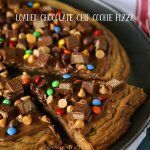 Loaded Chocolate Chip Cookie Pizza from Klienworth & Co.
Easy Peanut Butter Butterscotch Dessert Sauce from Bake Then Eat. Cookie Dough Butterscotch Cookies from Cookie Dough and Oven Mitt.